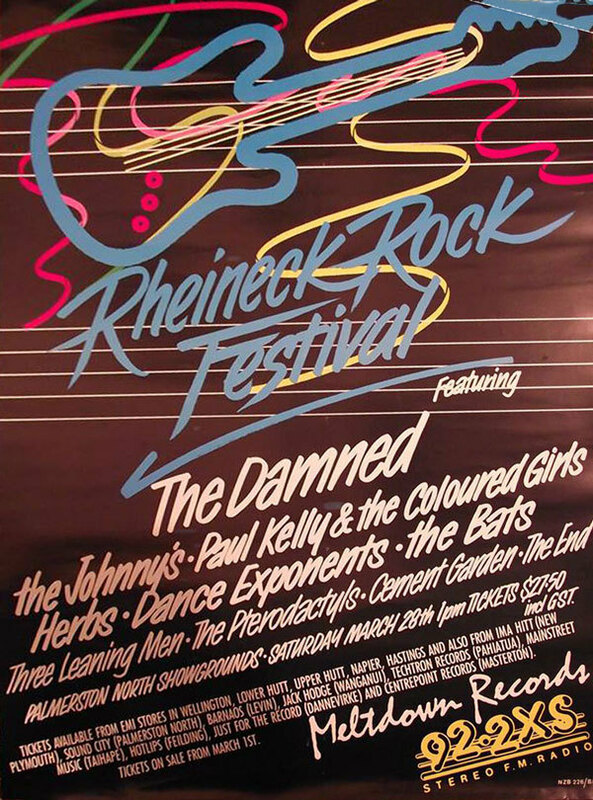 Based in Palmerston North, ambitious independent label Meltdown Records brought together British punk legends The Damned and a strong brace of Australian and New Zealand acts for the Rheineck Rock Festival in late March 1987. Heralded by a full-page ad in RipItUp and eye-catching glossy posters, the all-day musical feast at Palmerston North Showgrounds wasn’t a financial success. However, it succeeded in placing Meltdown’s best groups – Three Leaning Men, The Pterodactyls, Cement Garden and The End – on the big stage in their hometown, all for a mere $27.50 per ticket. The small Manawatu indie label released a string of distinctive records by Palmerston North and Auckland-based groups between 1985 and 1989. Meltdown Records had been up and running since 1985. 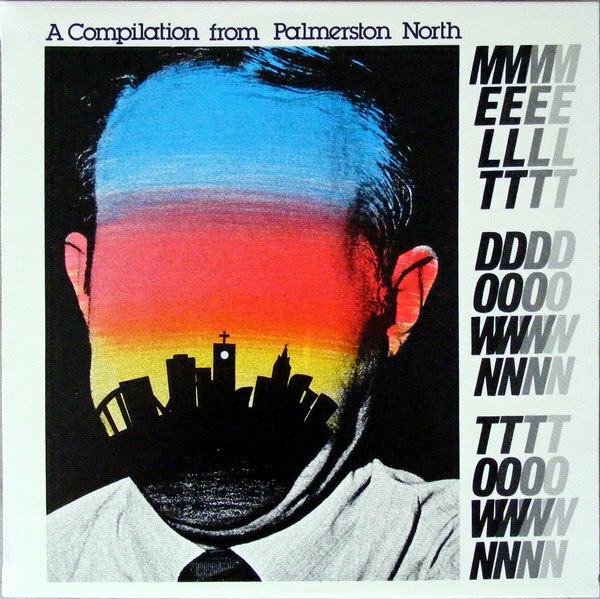 Partly funded by Massey University Students Association and steered by university-based groups Dosage B, The Mannequins and The Remarkables, the small Manawatu indie label released a string of distinctive records by Palmerston North and Auckland-based groups between 1985 and 1989. Steered by Peter Shepherd, Meltdown Records took the city’s new sounds into a string of live rooms across NZ. The label’s central groups were Three Leaning Men and The Remarkables, named for the Central Otago mountain range. Both bands were strong on the melodic indie guitar sound of the time. 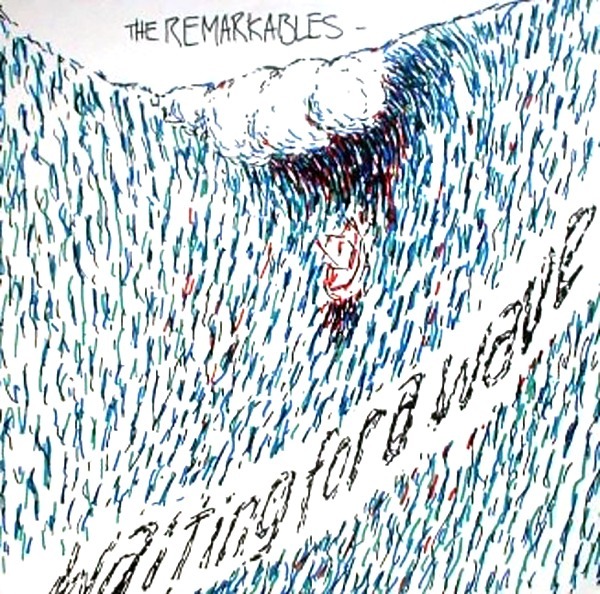 The Remarkables – Chris Heaphy (guitar, vocals), Alan Gregg (keyboards, bass), Paul Westbury (guitar) and Brendan Conlan (drums) – were the lower North Island city’s early response to the national outpouring of guitar based indie rock in the mid-1980s. A popular quartet, they came second place in the Massey University 1985 Orientation Battle of the Bands. Winning act The Mannequins were splitting up, so The Remarkables used the first prize of studio time to record the Waiting For A Wave EP at Crescendo studios in Wellington. Small indie labels in provincial cities with a university were a key element of the indie music movements of the mid-1980s and 1990s in New Zealand and internationally. The decentralisation of music production from more dominant, larger centres was part of a wider international and national turn that emphasised and rewarded local identity. Much of the necessary infrastructure was already there. Specific local exposure could be gained through RipItUp, dedicated sections in mainstream and student newspapers, in localised fanzines and through New Zealand music shows on campus radio stations. Student newspapers (in Massey University’s case it was Chaff) could be found on every tertiary campus in New Zealand through a mutual distribution scheme. In time, student stations would take a further step and produce their own dedicated magazines, such as Book of Bifim in Auckland. New Zealand music shows on university radio stations created a de facto national network, willing and able to promote and inform listeners about new and marginalised local music. Promotion of indigenous music became a strong part of any student station’s identity through the involvement of staff in bands and the station in promoting and sponsoring NZ acts, particularly those from the immediate area. The wider student station playlist similarly exposed likeminded acts from overseas, providing a broad musical context. In 1986 and 1987 New Zealand’s student stations banded together to produce the Weird Custom, Weird Culture and Spins and Needles compilations, collecting up tracks that were nominated by individual stations. Popular student radio shows such as Auckland’s Freak The Sheep had already introduced their own take on the emerging new music with Outnumbered By Sheep and later the Freak The Sheep compilations. Meltdown Records was filling a similar local need by chronicling many of the new bands that were popping up in the city. The first record released came from Dosage B with radio DJ and future comedian and TV host Jeremy Corbett on guitar. 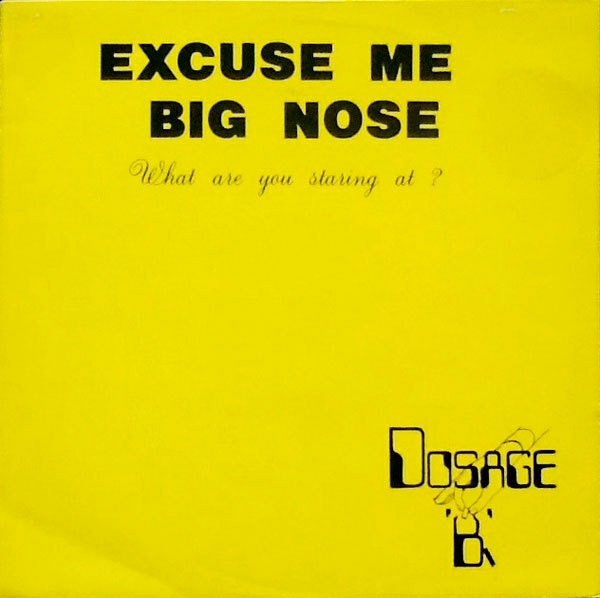 It wasn’t surprising that Monty Python provided the title for the group and label’s first EP, Excuse Me, Mr Big Nose, in September 1985. All 300 copies sold out quickly. When a group of ambitious Radio Massey radio staff led by future cabinet minister Steven Joyce set a new private radio station, Energy FM, in Joyce’s hometown of New Plymouth in 1986 and 1987, Corbett would be one of the DJs. 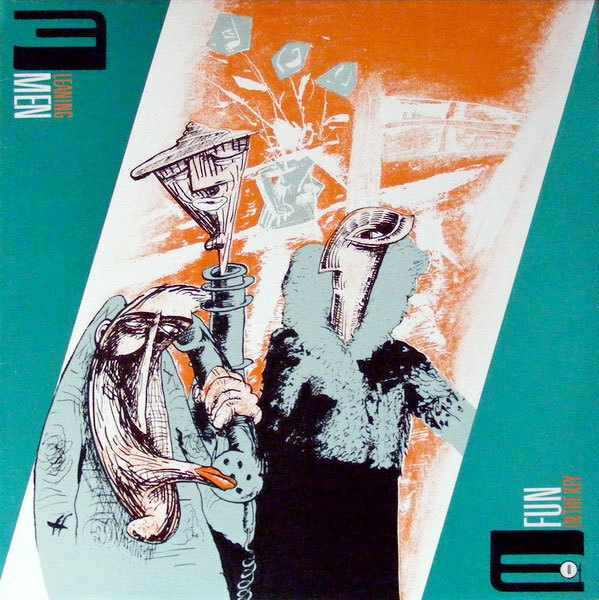 New records from Cement Garden – Leonard Carney (drums), Sean O’Conner (guitar), Jonathan Collins (guitar/ sax/ vocals) and Eleanor Boekman (bass/ vocals) – and The Remarkables (‘Vegetarian’ with new drummer Zane Greig) followed on Meltdown in 1986. Later that year, the label and its early groups featured on TV show Video Dispatch. To showcase the rising groups, a new city venue at the Commercial Hotel opened in 1985 and ran through to late April in 1986. The majority of the local bands performing at the two-day closing event were compiled on a new album that was partially funded by the shows. 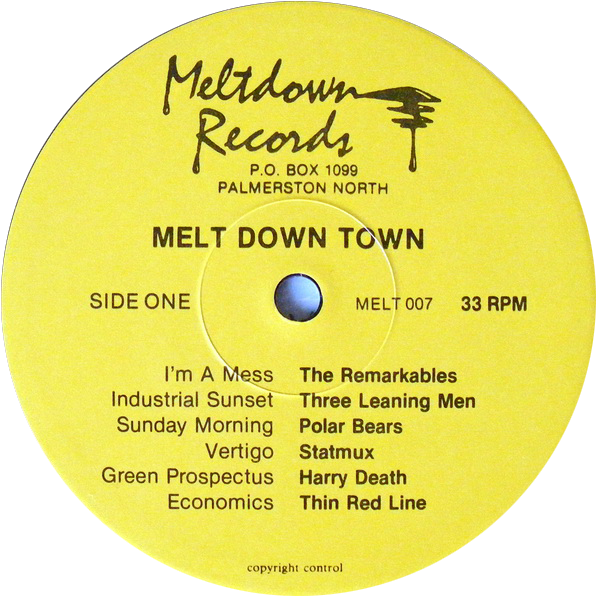 Melt Down Town, the label’s scene compilation of Palmerston North groups from 1985 and 1986 was released, adorned by a stunning Chris Heaphy-designed cover. It contains rising groups Polar Bears, Three Leaning Men, Statmux, Harry Death and Iceland Bars alongside older acts such as The Remarkables, Thin Red Line, Swiss Kids, Coloured Talk, Cement Garden and The End. Paul Campbell, who produced 11 of the album’s 12 groups at Kerrie and Richard Dargie’s Dolphin studios (established in January 1986), was a member of The End, who contributed the song ‘What’s Your Problem’ to the compilation. Campbell had been in Catch22, who released an EP in the early 1980s. He was also behind Palmerston North venue El Clubbo, which featured local and touring groups of the time including Daggy and The Dickheads, Skeptics, The Newmatics and Jason Sad and The Years. In the mid-1980s The Remarkables’ Chris Heaphy and Peter Westbury established a new venue called The Swamp in Palmerston North’s Southern Cross nightclub. Having played extensively in their home city, they played support to The Chills at The Albert Lodge in July and toured the North Island in November and December 1985 under the banner Waiting For A Wave. The group’s year culminated with a multi-band show at New Plymouth’s Bowl of Brooklands on December 16, 1985. Bowing out to a full house in Palmerston North pub venue The Superliquorman the following October, The Remarkables left one final track, ‘I’m A Mess’ on Weird Custom, Weird Culture. The Superliquorman continued to host local groups, with Cement Garden, Three Leaning Men, Auckland punk group The Warners (who had the four-song 7-inch EP ‘Elsie's Got A Gun’ out on Meltdown in 1986) and The Bananamen all playing in the following weeks. 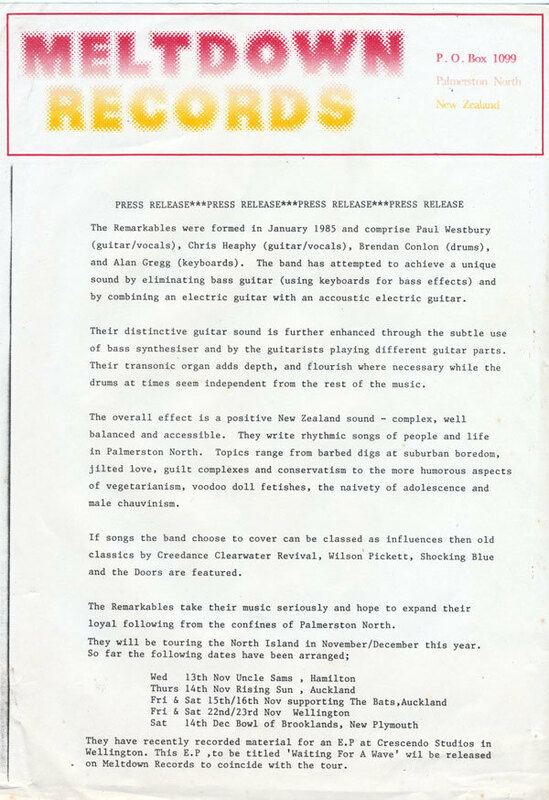 National recognition for the city scene arrived in December 1986 with John Dix’s “Waiting For A Wave: Music From The Manawatu” published in RipItUp, which also identified the Taverner’s Arms as a new local venue that was open to lo-fi groups. Three Leaning Men's 1987 album Fun In The Key Of E. The band featured Alan Gregg, later of The Dribbling Darts Of Love and The Mutton Birds, and a sleeve by Fane Flaws. Meltdown Records, meanwhile, announced plans for three new albums in 1987 by bands Three Leaning Men, The End and Harry Death. Fronted by guitarists Lindsey Gregg and Greg Malcolm-Boelee and with Jeremy Corbett’s brother Nigel drumming and Rhys Bevan then Alan Gregg on bass, Three Leaning Men released the label’s only individual group album in mid-1987 – the Nigel Stone-produced Fun In The Key Of E.
Recorded in Dolphin Studios in June 1986 and January 1987 (during which time Rhys Bevan left the group), the 10-song LP was mixed and produced by Stone and the group in Marmalade Studios in February 1987. The new album featured the impressive and powerful ‘Masculinity,’ which was a highpoint in their live set. Another album track, the reflective ‘By Your Leave’ was made into a video by Chris Fielding. Three Leaning Men supported The Chills in New Plymouth on January 1, and hit the highway with labelmates The Pterodactyls in February, March and April. 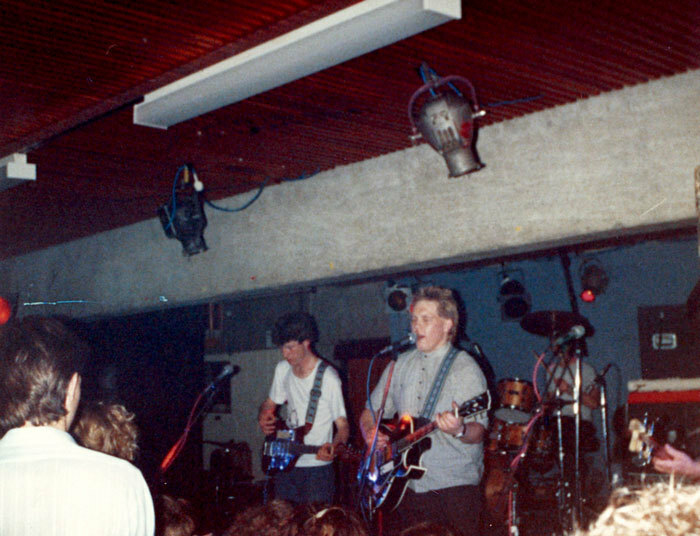 Formed in July 1985, Three Leaning Men had played their first show supporting Sneaky Feelings at Massey University. Over the next four years, they were a constant presence on the Palmerston North and national indie scenes. Three Leaning Men supported Hunters & Collectors in Palmerston North in May 1986 and placed ‘Happy’ on Weird Custom, Weird Culture and ‘Industrial Sunset’ on Meltdown Town. In late December they saw the year out with a weekend of New Plymouth shows. A Greg Malcolm-Boelee solo tape also appeared. With Fun In The Key of E due out in March 1987, Three Leaning Men supported The Chills in New Plymouth on January 1, and hit the highway with labelmates The Pterodactyls in February, March and April. It was a busy start to the year, which had already seen them perform before New Order at Wellington Town Hall on February 2. The Pterodactyls first got together in 1985 and were mostly refugees from the South Island indie scene who were resident in Auckland. Jeff Batts (bass and vocals) was formerly in Dunedin’s The Stones and Richard James was from Christchurch band Mainly Spaniards. Guitarist Ken Stewart was new to music and an ex-Dunedinite, while Dave Ford represented Auckland, where he’d been in Normal Ambition. Early shows found them at Auckland’s Windsor Castle with Able Tasmans in late July 1985, performing underneath flying models of multi-coloured dinosaurs and featuring a cover of Buffalo Springfield’s ‘For What It’s Worth’ in a set that The Pterodactyls encored with The Stones’ ‘Down and Around’. In early October at Auckland’s Six Month Club, they supported Jonathan Richman and The Modern Lovers. 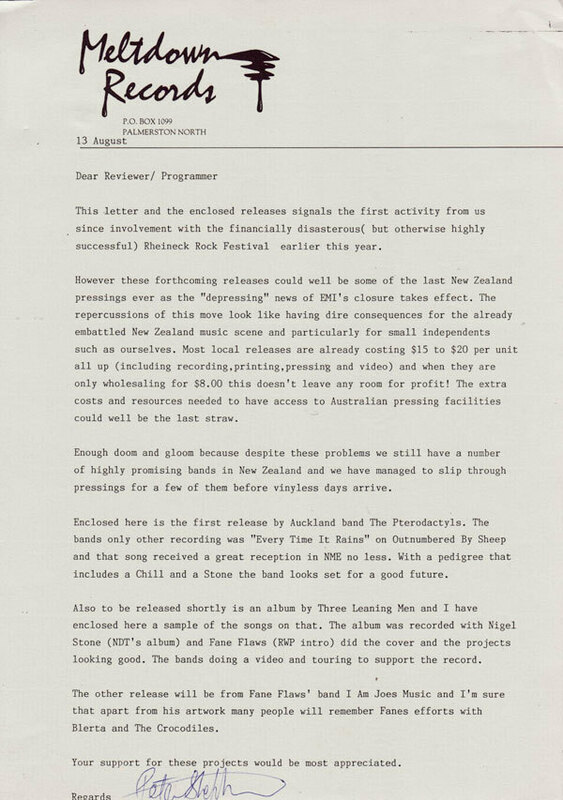 The Richard James gem ‘Every Time It Rains’ was a high point on the strong Outnumbered By Sheep compilation – put together by Auckland student station bFM and released by Flying Nun Records in 1985. The group played in support of the album on March 8 at Auckland University Café with Goblin Mix and Fetus Productions. After post-Christmas dates at Christchurch’s Zetland, The Pterodactyls saw out 1985 at arts venue Chippendale House in Dunedin alongside The Verlaines, Look Blue Go Purple and Roy Montgomery. Three days later they headlined at the southern city’s Oriental Tavern. In Auckland’s Aotea Square in April 1986, a new look Pterodactyls lined up for an outdoor concert with Bird Nest Roys and Goblin Mix. Richard James had departed to be replaced by Martin Kean, late of Dunedin’s The Blue Meanies and The Chills. That was the group who joined Hamilton’s Human Lawnmowers and Battling Strings at the Windsor Castle in late July. A show with Dance Exponents at Tuxedorock nightclub was cut short after one set when the club decided The Pterodactyls were not commercial enough. With Battling Strings down from Auckland, The Pterodactyls and Three Leaning Men kicked off a rambling tour at Massey University in Palmerston North on February 28, 1987. Orientation shows at Waikato University with Battling Strings and Otago University with The Puddle and The Axemen were followed by a trip to Canterbury University in early March. There were two more Dunedin shows at Chippendale House and the Burgundy Bar in the European Hotel as well as a two-night stand in Wellington’s Cricketers later that month. Three Leaning Men and The Pterodactyls repeated the billing at the Cricketers in late April. Both groups had records due out. However, neither record would appear until the middle of the year. In late August 1987 Three Leaning Men fronted up at New Plymouth’s Bellblock for the No Ordinary Band Contest, which attracted a strong line-up of indie groups from the mid and lower North Island. It included Gisborne’s The Big Fix, who released a stunning single that year on F-Star Records. Hamilton stumped up the fiery Pieces of Cod and gothic Cygnet Committee, who eventually placed second. New Plymouth itself had Casualty, The Nod, The Candles, The Bananamen and eventual winners Sticky Filth. 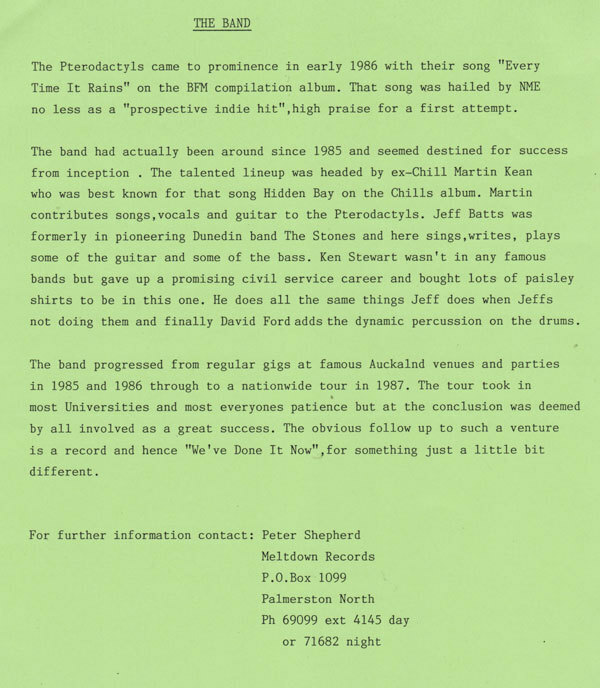 The Pterodactyls' EP We’ve Done It Now arrived in August 1987, recorded with the new line-up on February 7, 1987 at Auckland’s Harlequin Studios. 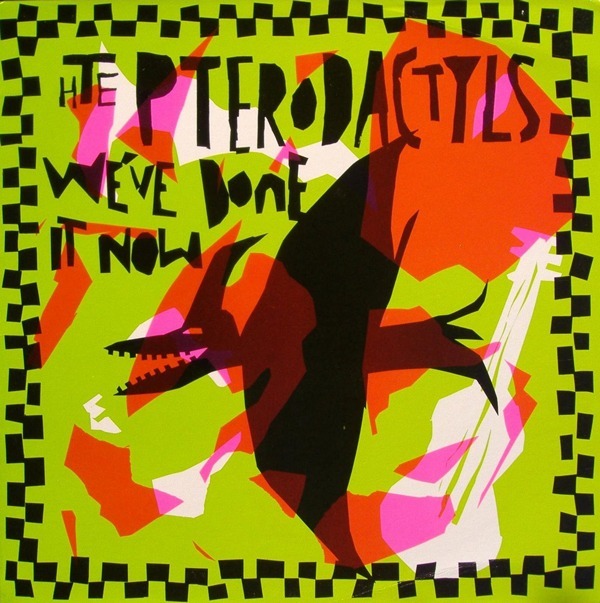 The Pterodactyls' EP We’ve Done It Now arrived in August 1987, recorded with the new line-up on February 7, 1987, at Auckland’s Harlequin Studios. The EP was unusual in that all five songs were on one side of the disc, leaving the other side blank. 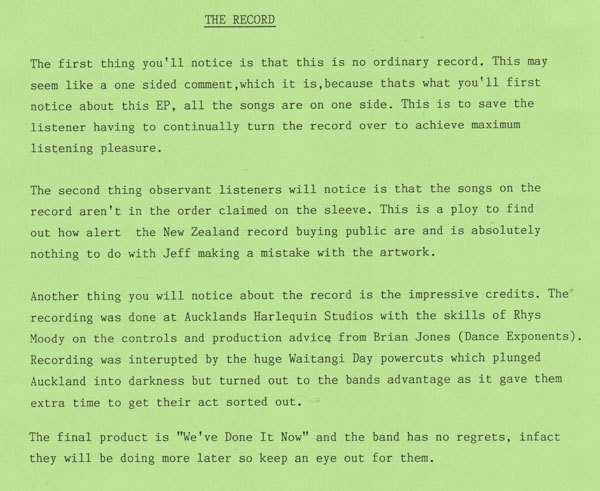 Meltdown Records’ press release for the record pointed to a wider problem: “The forthcoming releases could be some of the last New Zealand pressings ever as the depressing news of EMI’s closure takes effect. The repercussions of this move look like having dire consequences for the already embattled New Zealand music scene and particularly for small independents such as ourselves. 1988 started well for Three Leaning Men with shows in front of touring Australian band Painters and Dockers, a consolation for their aborted slot at the cancelled Neon Picnic festival earlier that year. There was one final, belated release from Meltdown Records – the little-seen, era-spanning Melter Shelter in 1989. Only Paul Campbell and The End survived from the previous gathering of bands. Luckily, the future of the city’s alternative music scene lay in its grooves with The Clear and its member Dave White, who led the next charge with Lung and Yellow Bike Records – and Earwigs Under Fire, whose line-up included key members of the mighty Feast of Stevens.